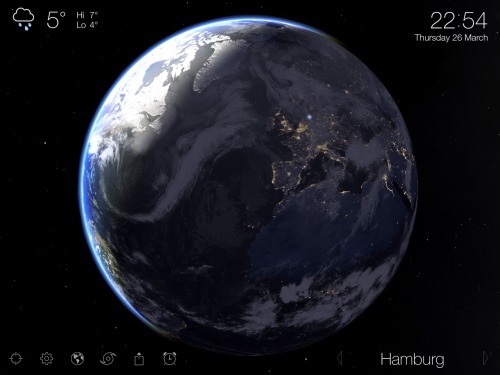 Living Earth maps the current clouds onto a globe. Quite marvelous. Quite accurate. And it is fun to push and twist our space ship earth around. In addition you get wind and real heat maps. The current local temperature is even displayed on the app icon. An intelligent mis-use of iOS’ notification system. On my wish list: animation of historical data. e.g. a one week time lapse of the clouds. Or a one year time lapse of the temperature. StockTouch. Numbers are dull, right? Well, it is a matter of data visualization if this is the case or not. 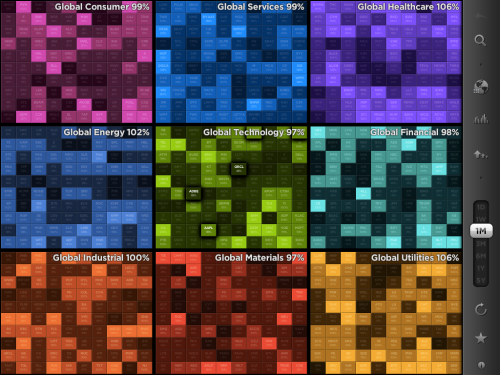 StockTouch provides a colorful view into Wall Street’s stock market. Spread and pinch gestures are used to zoom in and out of market sectors and individual stocks – zooming is even accompanied by subtle audio feedback. Swiping can be used to navigate between stock views. No, numbers are not dull as long as they are represented like this.